The S&P Dividend Aristocrats index is an elite group of companies, members of the S&P 500, which have managed to increase dividends every year for at least 25 consecutive years. 3. Meet minimum float-adjusted market capitalization and liquidity requirements defined in the index inclusion and index exclusion rules below. Those companies deliver both strong income growth and strong total returns over time. The consecutive years of dividend increases serves as a filter for quality – only a company with a stable business model can afford to grow the business, increase dividends and intrinsic value over a quarter of a century. The ability of management to maintain stable or increasing dividends indicates the quality of a firm’s earnings and its growth prospects. The index was started in 1989, and had 26 original components. The number of components in the index has ranged between 26 in 1989 to 64 in 2001. I used this list as a primary tool for identifying companies with strong brands, which have raised distributions through both good and bad economic conditions. Check this post Historical changes of the S&P Dividend Aristocrats Index for reference. Out of the original 26 components of the dividend aristocrat index, only seven members remain in it. 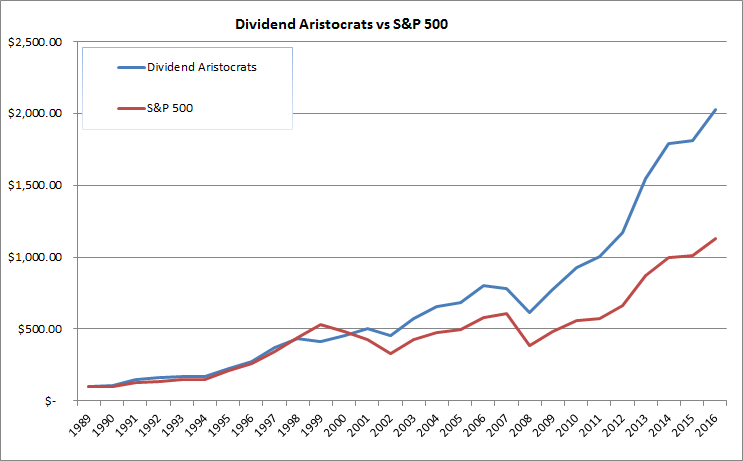 Since 1989, the Dividend Aristocrats have managed to outperform the S&P 500 index. 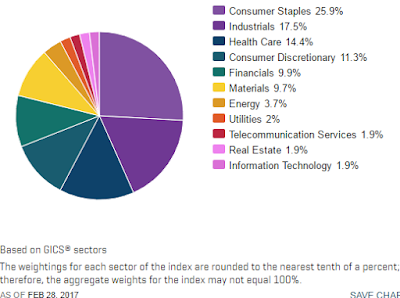 The S&P Dividend Aristocrats index represents a diversified list of companies, with representation from all 11 sectors that S&P tracks. All companies are equally weighted. To open in a new spreadsheet click this link. When I first started out dividend investing a decade ago, the list of dividend aristocrats was the best list available to me. I instantly recognized that it included a lot of world class companies for further research and analysis. However, today I prefer the list of Dividend Champions. I believe that the list of Dividend Champions provides the most complete view of US companies which have a minimum 25 year track record of annual dividend increases. - Why do I like the Dividend Aristocrats?